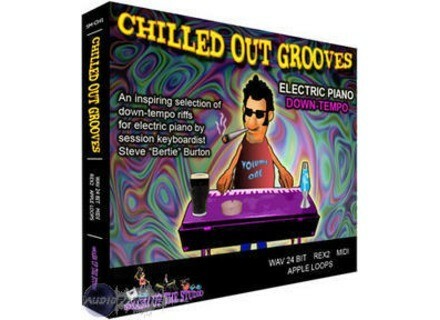 Chilled Out Grooves: Down Tempo, Electric Piano Sample from Equinox Sounds. Equinox Sounds has released Chilled Out Grooves: "DOWNTEMPO", a downloadable loop collection from it's new content partner, Smash Up The Studio. 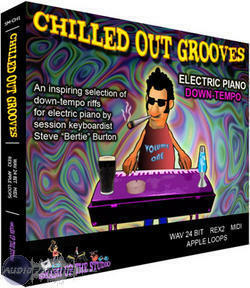 Chilled Out Grooves: "DOWNTEMPO" is a selection of laid-back Ambient and Chill Out grooves for electric piano performed by top session keyboardist Steve "bertie" Burton. Ranging from 65-110 bpm each riff is a complete 8-bar chord progression and can be used to form the basic chord structure for an entire track. Also included are the the original MIDI files for each loop to give complete versatility. Chilled Out Grooves: "DOWNTEMPO" was recorded and mastered using 24 bit audio, and is available as AIFF, WAV, Midi, REX2 and Apple Loops formats. Steve "Bertie" Burton's career as a session musician spans 2 decades (20 years) and has covered many genres. From House, R&B and Pop, thru to Jazz, his keyboard work can be heard on many great mixes by artists such as Whitney Houston, Janet Jackson, Babyface, Seal, George Michael, Justin Timberlake, to name but a few. CHILLED OUT GROOVES: "DOWNTEMPO" is currently available for $59.95 as a download. For more information, visit their web site at www.equinoxsounds.com.